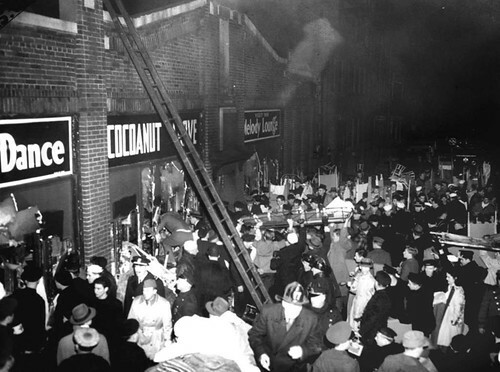 A fire in the Cocoanut Grove in Boston nightclub kills 492 people. It was the second-deadliest single-building fire in American history; only the 1903 Iroquois Theatre fire in Chicago had a higher death toll, of 602. It was only two years after the Rhythm Club fire which had killed 209. This signaled the end of almost 500 years of Ottoman rule in Albania. The leaders raised the flag on the balcony of the two-story building in Vlora where the Declaration of Independence had just been signed. A fire in the Cocoanut Grove nightclub in Boston, Massachusetts kills 492 people. The Treaty of Hopewell is signed. In the Battle of Cane Hill, General John Marmaduke’s Confederates are defeated by Union troops under General James G. Blunt. The Irish Republican Army ambush a convoy of British Auxiliaries and kill seventeen of them.